This 2-day tour from Bali will give you a great artistic, cultural and architectural overview of the island of Java. Tour the city of Yogyakarta, visit UNESCO World Heritage-listed Borobudur Temple and Candi Prambanan, and learn about local fine arts at a textile factory and leather puppet-making center. Overnight accommodation and round-trip airfare are included (if option is chosen). You’ll be picked up from your hotel in Bali and taken to the Bali Ngurah Rai International Airport (also known as Denpasar International Airport) for your morning flight to the island of Java. When you land in the city of Yogyakarta, your guide will meet you at the airport and take you on a sightseeing tour of the city, during which you’ll experience the hustle and bustle of Javanese life. 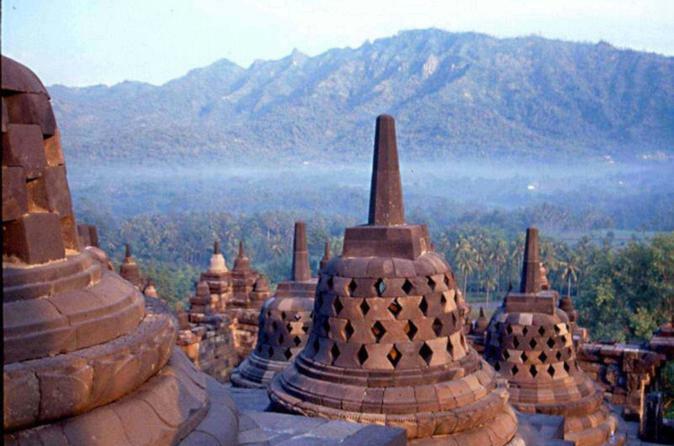 Next, drive 1.5 hours north to Magelang to visit must-see UNESCO World Heritage-listed Borobudur Temple, a 9th-century Mahayana Buddhist temple. Take a walking tour of this historical, religious and architectural gem, and admire the lush mountain backdrop. You’ll then visit Candi Prambanan, another 9th-century Hindu temple complex and UNESCO World Heritage Site. Dedicated to the Trimurti -- the expression of God as the Creator (Brahma), the Preserver (Vishnu) and the Destroyer (Shiva) – Prambanan is one of the largest Hindu temples in Southeast Asia, and will fascinate you with its ruins that still feature fine contours and intricate stone carvings. After your temple tours, you’ll be taken to your hotel. After breakfast at your hotel, discover Yogyakarta’s artistic side on another city tour. Start with a visit to Sultan’s Palace, the seat of java’s most powerful royal family. Then, stop by a batik factory to see how these fine Javanese hand-printed textiles are produced. Your last stop is a center where the famous wayang kulit leather puppets are intricately crafted by hand. Your guide will explain how the type of theater that uses these puppets has been designated a UNESCO Masterpiece of Oral and Intangible Heritage of Humanity. Your tour will conclude with a transfer back to the airport for your afternoon flight to Bali. When you land, you'll be picked up and taken back to your hotel. Please note: If you'd like to make flight arrangement on your own, please choose '2-Day Java Tour without Flight' option.